1. You can never have too much Tina. 2. Something much more momentous just happened in her life. Tina got engaged. Sorry fellas! Who's the lucky guy? He's Rhys Lloyd. NFL fans will recognize that name. 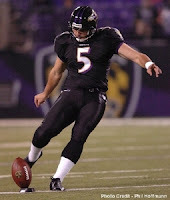 Rhys is a place-kicker who was with the Baltimore Ravens in 2007 and has signed with the Carolina Panthers for 2008. Congratulations to Tina and Rhys, and here's wishing them a lifetime of happiness. More Tina news: Check out this preview clip of "Big Break: Kaanapali" on the Golf Channel Web site.